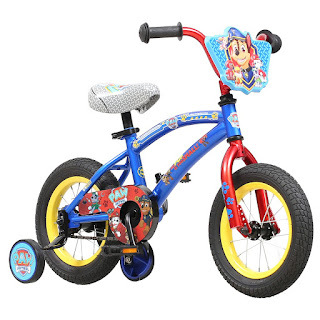 Target has the 12" Paw Patrol kids bike on sale for just $59.99 (regularly $79.99). Plus, now through November 10, Target is offering 25% off one toy, sporting goods or craft activity kit bringing the price down to just $44.99. To get this digital coupon text TOY to 827438 (limit one). This discount can be used in-store and online. To use in-store, show the barcode on your phone to the cashier. If you are using it online, enter the code at checkout. With first-time riders in mind, this fun kids bicycle includes training wheels, coaster brakes, an easy-adjust seat post and a durable steel frame that can withstand an accidental topple with ease. And as your rider advances, the removable training wheels make it easy to transition toward a big-kid bike.